My first experience of Delta's herringbone layout. Same as Cathay's one, it offers the most privacy in class. New addition to my aviation T-shirt collection. Delta's special T to support the victims of the 311 Eastern Japan Earthquake. The activity "Take Off Nippon" was started by volunteers including Delta's local mechanics based in Japan. 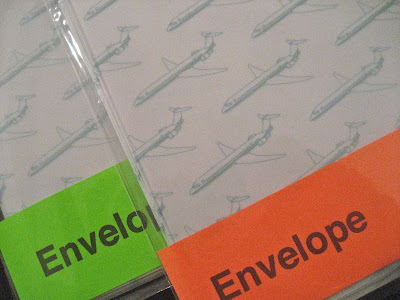 My friend and Art Director Nishioka-kun gave me these nice envelopes he designed. 2 rear engines without winglet. That means the MD80 series (How it attaches vertical stabilizer tells it's not the Fokker 100). He has a good taste of airplanes. I'm in Laos for the first time in 8 years. However, this time I stay just for 45 min stopover without entering the country. I hung around in the lounge for about 20 min and went back in the cabin hastily. If you have to leave Phnom Penh tomorrow, this is the place for your last dinner in town. A French restaurant in more than 100 years old French colonial style former Indochina Bank building. Big bank vaults still remain beneath the dining room. Once I stepped out of the restaurant after dinner, I was surrounded by the darkness that reminds me of Shanghai in the early 90s. Security Prison 21 a.k.a. S21 once belonged to Khmer Rouge is now open to the public as The Toul Sleng Genocide Museum. They say only 8 survived among 14,000-20,000 prisoners who were imprisoned from 1975 through 1979. I can't believe this happened in the time after I was born. The site was originally built as a lycée, and ironically, a facility to nurture humanity was turned into a place to destroy humanity. Former Foreign Correspondents' Club of Cambodia. Now it is a boutique hotel belonging to the same hotel group as the one in Siem Reap. A great place for viewing Tonlé Sap River at dusk, and geckos, while having a cold drink. In this city, tuk-tuks drive much slower than the ones in Bangkok.